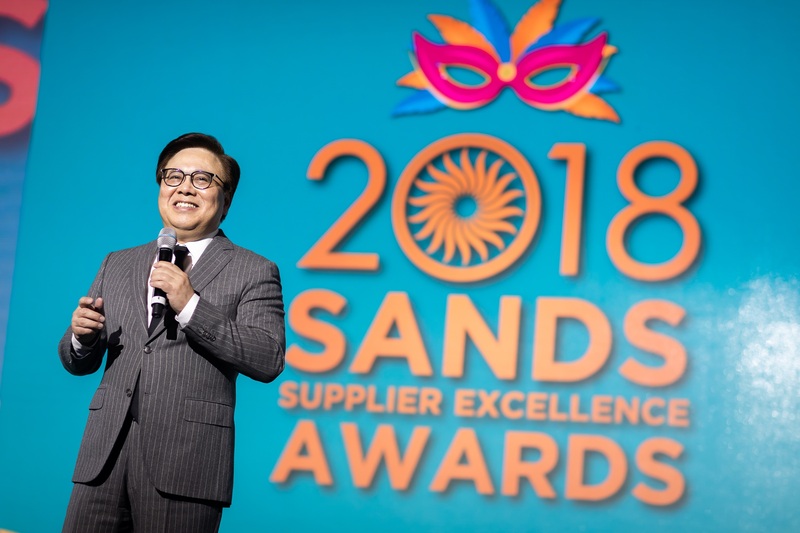 (Macao, Nov. 29, 2018) – Sands China Ltd. honoured several of its outstanding suppliers Wednesday at The Venetian® Macao, at the 2018 Sands Supplier Excellence Awards. A global initiative of Sands China’s parent company, Las Vegas Sands Corp., the annual event recognises the cooperation and services of some of the company’s most noteworthy suppliers worldwide. Various Sands China business units and their employees nominated a total of 30 companies in this year’s awards. Nominees are chosen from a pool of thousands of service providers and suppliers that do business with Sands China. The range of year’s nominated companies includes industries such as food and beverage; marketing; construction; furniture, fixtures and equipment; and operating supplies and equipment, among others. Awards were given to distinguished suppliers in seven categories: small- and medium-sized enterprise (SME); innovation; quality management; project management; corporate culture and sustainability, service excellence; and cost management. Winners include local SMEs – a testament to their growth and to Sands China’s continuous support to local enterprises. Over 400 guests attended Wednesday’s awards ceremony, including nearly 300 representing about 150 suppliers, mostly from Macao, Hong Kong and mainland China. The event featured carnival-themed entertainment and an appreciation dinner, with each guest receiving a gift of two eco-friendly stainless steel water bottles – provided by one of Sands China’s local SME suppliers. Award winners are selected each year by a judging committee composed of Sands China executive management. Judges consider several criteria, including suppliers’ leadership, vision and strategy; product consistency and process capability; and creative partnership opportunities. Small- and Medium-Sized Enterprise (SME) Kin Nam Hong Co. Ltd.
Project Management LDF International Ltd.
Photo caption:Dr. Wilfred Wong, president of Sands China Ltd., addresses guests at the sixth Sands Supplier Excellence Awards Wednesday at The Venetian Macao. The annual event recognises the high level of cooperation and service of some of the company’s most outstanding suppliers. Photo caption: Representatives of seven outstanding companies are honoured on stage at the 2018 Sands Supplier Excellence Awards Wednesday at The Venetian Macao, attended by Dr. Wilfred Wong (sixth from left), president of Sands China Ltd., and Charlie Cai (first from left), vice president of procurement and supply chain for Venetian Macau Limited.